Being born too early can have a profound effect on your child's health. In addition to early concerns about lung development and intestinal issues, prematurity may also cause vision problems. Despite vision complications, many children who were born prematurely do have usable vision, thanks to early interventions. These six eye diseases and conditions may occur in babies born prematurely. ROP primarily affects babies that weigh less than 2 3/4 pounds and are born before 31 weeks' gestation, according to the National Eye Institute (NEI). The disease occurs when abnormal blood vessels grow in the retina and interfere with normal vision. The retina is the light-sensing layer that lines the back of the eye and sends light impulses to the brain, where they're converted into images. In some cases, the abnormal blood vessels leak, making vision even worse. Scar tissue formation can also affect vision and may cause the retina to detach from the back of the eye in the most severe form of the disease. Retinal detachment may result in partial or complete blindness if treatment isn't successful. Fortunately, 90 percent of babies who have ROP develop normal vision and never need any type of treatment. Every year, 1,110 to 1,500 babies are born with a severe form of the disease that does requires treatment, reports the NEI. Babies who had breathing problems, seizures, infections, heart disease, anemia or other health problems, or required blood transfusions or mechanical ventilation are at increased risk of developing the disease. In the past, babies who received high levels of oxygen in the neonatal intensive care unit were more likely to develop ROP. Today, oxygen levels are more closely monitored to reduce the risk. ROP treatment stops or slows the growth of abnormal blood vessels by destroying the outer edges of the retina with lasers or cryotherapy (freezing). Because the outer portions of the retina are responsible for peripheral vision, your child will lose a little side vision after treatment. Other treatments for ROP include vitrectomy, a procedure that replaces the gel inside the eye with saline solution, and a scleral buckle, a silicone band placed around the white part of your child's eyes. Both treatments can help prevent retinal detachments. Children who are born early may be more likely to develop myopia, or nearsightedness. The condition occurs when your child can see near objects more clearly than objects in the distance. 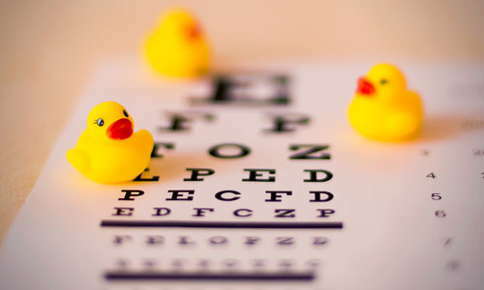 Prescription eyeglasses and contact lenses offer a very effective way to correct your child's vision. Convincing young children to wear eyeglasses may sound like a difficult task, but many babies and toddlers don't object to the glasses when they notice the improvement in their vision. Strabismus, commonly called "crossed eyes" may cause an eye to turn down, up or to either side. Not surprisingly, misalignment of the eyes can make it much more difficult for your child to see properly. Treatment options for strabismus include patching the stronger eye, eyeglasses, prism lenses or surgery on the muscles that control eye movement. Ambylopia, or "lazy eye," often develops in conjunction with strabismus. If your child has ambylopia, vision in the eye is turned off, due to a problem with the connection between the brain and the eye. Diagnosing and treating ambylopia at young age can help your child avoid permanent vision loss. Common ambylopia treatments include patching, vision therapy and eyeglasses or drops that blur vision in the "good" eye, forcing the "bad" eye to become stronger. Prematurity may also increase your child's risk of developing cataracts. Although cataracts most often occur in older people, they can be present at birth or develop during childhood. Cataracts occur when the normally clear lens located behind your child's iris becomes cloudy. Although cataracts don't interfere with vision when they're small, they can cause blurred vision as they grow and interfere with the connection between the brain and the eye. If your child has cataracts, he or she may be more likely to also develop ambylopia. Glasses or contact lenses may help improve your child's vision initially, but surgery is usually recommended if the cataract is large. Peripheral vision loss is an unfortunate consequence of laser treatment or cryotherapy used to preserve central vision. Children who have lost some side vision may benefit from prisms lenses that slightly expand their field of view and low vision aids that help them make the most of their vision. Regular visits to your eye care specialist are particularly important if your child has a vision problem related to prematurity. If it's been a while since we've seen your son or daughter, or he or she is complaining about difficulty seeing, contact us to schedule an appointment. "My whole experience was great. The entire staff was beyond friendly, helpful, and professional. Not to mention, the building itself was clean, spacious, and well kept. I recently switched to Herman Eye Center last year and I'm SO glad I did. Everyone just seemed so happy and cheerful!" "Dr. Herman was very knowledgeable and professional; the very best (excellent) in explaining his findings and corrective procedure. His office staff were very personable and helpful. Wish I had found them many, many years ago,, but I'm in excellent hands now and feel very comfortable about my future there." "hello, i was a new patient , and i really enjoyed the family feeling you get when you are there. my doctor and staff are awesome, and they want to help you in any way they can. i would tell everyone i can how wonderful the company is. THANK YOU"
"Great experience! I have been going to Dr. Herman for 7 years now. He is a great doctor. He is very friendly and takes the time to get to know his patents." "I am always impressed when they welcome me by name as I walk in the door, treat me like I am the only person in the room, move me swiftly from test to test and then am greeted with a smile and professional handshake by Dr. Travis. I walk away knowing that I have received an excellent exam and confident with the prescription. I have referred several people to Herman because they are the best I have ever experienced in the industry and I like to pass good news along to my friends." "Best optometrist in the valley. The staff are exceptional. I highly recommend and give them five stars"
"The staff is always very professional & pleasant. Dr. Herman has been very helpful throughout my years of being his patient. I would not consider seeing anyone else for my vision care. Every visit is a pleasure"
"Staff is always courteous and helpful"
"Everyone was so friendly and knowledgeable. Dr. Herman was great! He actually took the time to talk and get to know me. A great first time experience at Herman Eye Center!" "I love the fact that dr herman took the time to talk to me and get to know me. That's how all doctor should be. Definitely will see him again"
"I just love Dr Travis and he is always professional with me and all my eye care needs."